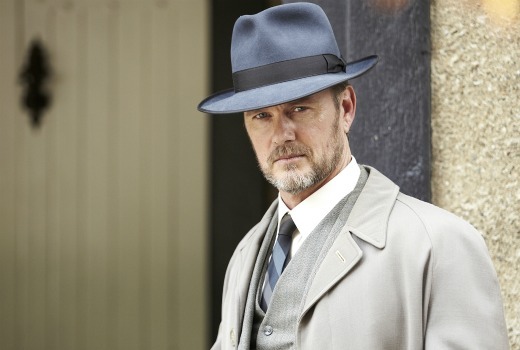 The Doctor Blake Mysteries will begin filming a second series in late July with a further ten episodes. Returning are Craig McLachlan as Dr Lucien Blake, Nadine Garner as housekeeper Jean Beazley, Cate Wolfe as district nurse Mattie O’Brien and Joel Tobeck as Chief Superintendent Matthew Lawson. In series two, Doctor Blake encounters mysteries around every corner; the church, politics, art, rock’n’roll. Nothing is sacred and no one is safe. Writers Stuart Page and Chelsea Cassio return and Marcia Gardner and Pete McTighe join the writing team. Declan Eames and Ian Barry will again direct and this series will also see episodes directed by Lee Rogers and Pino Amenta. Filming on series two will commence in Victoria on 29 July 2013. Just finished airing this week on BBC1……..really enjoyed it. Glad to hear that another series is in the pipeline. Hopefully BBC1 will pick up the second series, although our BBC is unpredictable and have been known to cancel really great shows even though they have good TVR’s. Great to see almost the whole cast is returning. Rick Donald’s the only one that isn’t returning by the looks of it (guessing this is due to his US pilot being picked up). I’m glad. Even if I can’t watch it. As for there being so many murders. That’s where suspension of disbelief comes in. I mean should there really be so many murders in Cabot Cove or St. Mary Mead or Midsomer (even if the latter is an area rather than town) ? That’s not mentioning other famous places with detectives or amateur sleuths. One of the best drama/mystery programs to be produced in Australia in many years. Very high production values, superb acting, engaging stories. Understated, yes. But that is part of its unique Australian flavour. How wonderful to hear that Pino Amenta is still working. He directed many stellar episodes of (to name just a few) The Sullivans, Carson’s Law and All the Rivers Run for Crawfords decades ago. I really enjoyed The Dr Blake Mysteries. Love Nadine Garner and Craig McLachlan, both great Aussie actors. Can’t wait to see season 2! It took me a few views to warm to it, but ended up loving Dr Blake by the end. Yes sure it’s implausable that so many murders happened in Ballarat in the 50s, but the acting and the accuracy of the era were quite spellbinding. I really tried to like it – I really wanted to like it, but the whole premise was really stretching credulity, as most of these amateur detective shows usually do. It really needs livening up, it was very low key. Fantastic Australian produced show. Good to see that Australians can do wonders with good scripts and excellent acting. Shame about only been ten episodes though. Excellent televisual news. It took me a few episodes to warm to Dr Blake, but then I was glued to the screen every Friday. Can’t wait for the next series. And the way things are going BBC-wise, we could do with a few more excellent drama series like Blake. Season 1 was great! I’ll enjoy this when it returns next Feb! ABC as quality drama!